We’d love your help. Let us know what’s wrong with this preview of The Curse of the Pharaohs by Elizabeth Peters. Victorian Amelia Peabody continues to journal her Egypt adventures, toddler Ramses left in England. Husband Radcliffe Emerson's old friend Lady Baskerville fears a curse killed her husband Sir Henry, and soon engages the attentions of American Cyrus. The will funds continued excavation. But a lady dressed in white floats, flutters, spreads fear, and more death. To ask other readers questions about The Curse of the Pharaohs, please sign up. THe above description is wrong, even in chpt 1 their son is 4 and a,half at least and disturbs his mama''s teaparty with,an excavated muddy bone..Did anyone else notice this? I enjoyed this less than the first book in the series, partly because a lot of it was so similar to that book. An archaeological dig is in peril due to local superstitions about a curse, exacerbated by disappearances, ghostly sightings and deaths. If I hadn't just read the first book last month, I might have liked it better. I also missed some of the cast from the first book. Walter and Evelyn were absent, and there were no new characters who balanced the intensity of Amelia and Emerson (which is I enjoyed this less than the first book in the series, partly because a lot of it was so similar to that book. An archaeological dig is in peril due to local superstitions about a curse, exacerbated by disappearances, ghostly sightings and deaths. If I hadn't just read the first book last month, I might have liked it better. I also missed some of the cast from the first book. Walter and Evelyn were absent, and there were no new characters who balanced the intensity of Amelia and Emerson (which is needed, I think) or that I really cared about. There was lots of shouting and arguing, all very humorously, but I wished there was more about the excavation and less of the people. I was actually thankful when Amelia used her parasol on one of the characters! Now to the mystery. Amelia is sure she knows who is behind all the dead bodies, but we don't get many clues along the way, and don't know what she's thinking until all is revealed. There were enough possible culprits that I really had no idea who it was until the end, but I didn't feel like I had enough information to figure it out, so the mystery was a bit lacking. It was more like a suspense novel with an abundance of 'calm in the face of calamity' and witty conversation along the way. The second book in the series and I enjoyed it every bit as much as I did the first. It's the two main characters who absolutely make these books. There is Amelia Peabody who believes herself to be the most intelligent person in any room - and sometimes she is, just not always. Don't try to tell her that though! She is one of those fabulous Victorian women who went out as explorers, riding camels (or donkeys in this case) in the desert and crawling around in hot, dirty excavations in totally uns The second book in the series and I enjoyed it every bit as much as I did the first. It's the two main characters who absolutely make these books. There is Amelia Peabody who believes herself to be the most intelligent person in any room - and sometimes she is, just not always. Don't try to tell her that though! She is one of those fabulous Victorian women who went out as explorers, riding camels (or donkeys in this case) in the desert and crawling around in hot, dirty excavations in totally unsuitable clothes. She also has the driest and best sense of humour which she uses mostly to spar with her husband Emerson. Some of their conversations are really laugh aloud funny. They make a very good team and a delightful example of a well married couple. So the other day I got into a mock fight with some Goodreader's over the relative merits of Ms. Elizabeth Peters and her "Amelia Peabody" series. For the uninitiated over the course of the series Mrs. Amelia Peabody Emerson, her cranky but brilliant Egyptologist husband Emerson, their semi-psycho brilliant son Ramses, adopted daughter Nefret and a host of other's who wander in and out of the narrative wander around Victorian era Egypt discovering tombs and solving murders and eventually getting So the other day I got into a mock fight with some Goodreader's over the relative merits of Ms. Elizabeth Peters and her "Amelia Peabody" series. For the uninitiated over the course of the series Mrs. Amelia Peabody Emerson, her cranky but brilliant Egyptologist husband Emerson, their semi-psycho brilliant son Ramses, adopted daughter Nefret and a host of other's who wander in and out of the narrative wander around Victorian era Egypt discovering tombs and solving murders and eventually getting mixed up in the things like World Wars, espionage and political upheaval in the Middle East. All the books are told from Amelia's POV and she's a very, very dry British woman ahead of her time who firmly believes herself the smartest person in the room. I swear I remember this series really, really fondly from my youth and I got a huge kick out of listening to the first in the series Crocodile on the Sandbank on audio a week ago. Its the story of how Emerson and Amelia meet and its spooky and fun and very English. Which is why I'm kind of baffled by how bizarre The Curse of the Pharaohs is. Several years have passed and Amelia and Emerson are petitioned by Lady Baskerville who's "archaeologist" husband (read: rich guy who liked Egypt stuff) has just died as a result of what everyone thinks is a curse on the tomb "he" (read: actual archaeologists who work for him) had just found. She wants Emerson to take over the excavation. 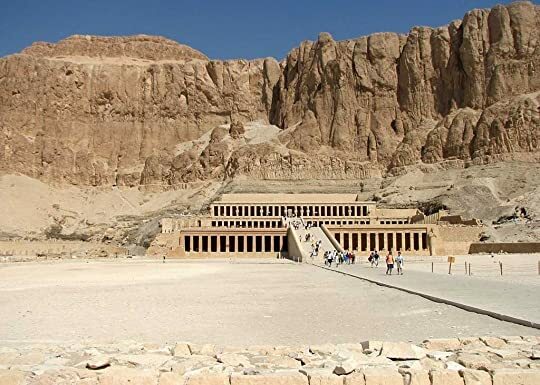 After several chapters of debate and preparation the Emerson's are off to the Valley of the Kings and a stay at Lady Baskerville's mansion where it quickly becomes obvious that someone is trying to put an end to any plans for the excavation of whatever lies in the tomb. It also becomes obvious that all the supporting players in this story are totally frickin' bonkers. The Emerson's are immediately surrounded by a cast of "wacky neighbors" who do nothing for the plot but muddy the waters and act bizarre. There's a crazy, obese old woman who just kind of shows up dressed as a nightmarish version of an Egyptian Queen who's always blind drunk and very insistent that Emerson is her reincarnated lover, her simpering, constantly weeping daughter who served no purpose to the actual story that I could figure out other than to provide a point of contention for no less then three suitors who are all vying for her hand. One of them is a German expert in something Egypt related, one of them is a Yankee (who says thing like "yeehaw" and "golly gee wilikers"), and one of them is a reporter who keeps writing inflamatory articles about the Emerson's in his rag of a paper. There's another guy too initially but he gets hit over the head and spends most of the book unconscious (thank god). So right there's been a murder...maybe. No one actually thinks Lord Baskerville was murdered until his former assistant also turns up dead and then some more people die but its also happening in the midst of the crazy drunk obese woman being crazy and the love triangle and archaeology stuff so forgive me if I've kind of lost the plot. Because that's what happens here. The plot totally vanishes in favor of a really bizarre sort of slapstick, "Abbott and Costello Meet the Mummy" kind of situation. Amelia and Emerson start competing to see who can solve the various mysteries first going so far as to poison and shoot at each other and Emerson at one point puts on this insane Egyptian themed "phatasmagoria" that's apparently supposed to draw the murderer out? Like why aren't they working together to solve a series of frickin' MURDERS?! Basically everyone involved in this is deeply, deeply insane. Its just a crazy, madcap "adventure" that doesn't have a real focus. I don't know if Peters was on like a second novel high where she thought she had to up the ante and make everything bigger and louder and crazier but the result is almost incomprehensible! I listened to this gem of a story through Hoopla, which I access through my local library. It is thrilling when I discover that a series I enjoy in audio as much as I did this one, by the talented and versatile narrator, Susan O'Malley. This tale commences five years after the previous book concluded. It produced such a comically, vivid picture that it had me laughing out loud. I have finally found a clean book series that provides wit, humor, and tons of new words to devour. The reuniting of . This tale commences five years after the previous book concluded. It produced such a comically, vivid picture that it had me laughing out loud. I have finally found a clean book series that provides wit, humor, and tons of new words to devour. The reuniting of Radcliff and Amelia Emerson with their precocious eight-month-old son, after a five-month separation, bewildered Emerson and Amelia. They were deeply disturbed by a strange roaring noise that increased in volume as they neared the nursery. To paraphrase the commentary . . . Sitting bolt upright in the middle of the floor was a baby. It was impossible to make out its features. All one could see was a wide cavern of a mouth, framed in black hair . . . I was struck at once by its shape, which was virtually rectangular. Most babies I had observed, tended to be spherical . . . . . . It's ample mouth split into a smile that produced dimples in both cheeks and displayed three small white teeth. "Mama, up, up, UP!" The author expresses herself so dramatically that it captures the reader's attention. Just when you may begin to feel a little lost or bored, her personal outburst will recapture your attention, or she might strike someone with her trusty parasol and then, just continue the story. She has a distinct way of portraying each intrinsically humorous experience, giving the reader a unique and uncommon perspective to observe. This is a historical romance that inspires clean and wholesome entertainment, bringing Radcliff and Amelia Emerson out of retirement. Each book in the series is a stand-alone mystery which can be read without previous knowledge. However, the characters age throughout the series and events in previous books (including spoilers concerning some of the main characters) are referenced in later books. I am enjoying this clean book series immensely, I thoroughly enjoyed soaking up the wit, humor, and tons of new words waiting to be devoured. In my opinion, any romantic insinuations were referred to charmingly in a discreet manner. Although this book does not always follow the social protocol, instead of taking leaps in many directions, the entertainment delivers great entertainment. The sparkling gems of dry wit were fabulous and plenty to be had! Oddly enough, there will most assuredly be reviews all over the chart for this writing, depending on the different perspectives from multi-faceted readers. Elizabeth Peters is quite the storyteller and expresses herself so dramatically that it captures the reader's attention and compels them to journey on. Just when you may begin to feel a little lost or bored, her personal outburst will recapture your attention, or she might strike someone with her trusty umbrella, defend those she loves with her pistol, or slash away at whatever offends. I was delighted with the notes within the book to the reader to explain what the author was trying to convey. I hope you enjoy this experience s much as I did! Such a fun read! I loved every page of it. Who doesn't love a feisty heroine and a good murder mystery that will keep you on the edge of your seat guessing until the very end? It’s official—I adore Amelia Peabody-Emerson! Modern feminist sensibilities injected into a Victorian heroine. She loves her husband and her son, but she needs some mental stimulation and some physical labour to keep her occupied. I loved that Radcliffe and Amelia have nicknamed their precocious son Ramses after the demanding and flamboyant Pharaoh. He takes after both of his parents, needless to say, in his intelligence and his firm opinions! I appreciate Amelia’s (sometimes unwarranted) self-confidence and her delight at being able to escape the boredom of motherhood and running a household. What could possibly be better than returning to Egypt to explore a newly discovered tomb with her beloved husband? Well, achieving that task while still having cooling baths at days end and tea whenever necessary, that’s what! Peters manages to give us plenty of potential murderers and lots of unusual characters to provide intrigue and comedy. Amelia brandishes her parasol with abandon and barges her way to a solution with panache! Warning: this review will involve spoilers for those who haven't read the previous book! Five years have supposedly passed since the events of the series opener, Crocodile on the Sandbank. (Many of the comments in my review of that one, www.goodreads.com/review/show/83042190 , are relevant here as well.) This would give us the date of 1889, with Amelia now 37 years old. By the close of the first book, she and Radcliffe Emerson were married (so strictly speaking, she's now Amelia Emerson, but he s Warning: this review will involve spoilers for those who haven't read the previous book! Five years have supposedly passed since the events of the series opener, Crocodile on the Sandbank. (Many of the comments in my review of that one, www.goodreads.com/review/show/83042190 , are relevant here as well.) This would give us the date of 1889, with Amelia now 37 years old. By the close of the first book, she and Radcliffe Emerson were married (so strictly speaking, she's now Amelia Emerson, but he still calls her "Peabody" as a nickname), and expecting their first child. He's now a precocious toddler, with an out-sized personality like his dad's (his real name is Walter, after Emerson's brother, but he's nicknamed Ramses after the flamboyant Ramses II). Parenthood has kept the couple in England, though chafing to return to their beloved Egyptian archaeological work. But now, they're unexpectedly called back to the latter. Rich archaeology patron Lord Baskerville ("of the Norfolk Baskervilles, not the Devonshire branch;" it's no mystery that Peters is an Arthur Conan Doyle fan, and we have a "Charles Milverton" here too!) has made headlines with the discovery of a possibly royal tomb in the Valley of the Kings --and with his sudden and mysterious death the night after the tomb door was breached. The popular press is playing up the idea of supernatural ancient curses, particularly since the archaeologist working for him is now missing. Baskerville's widow, who was acquainted with Radcliffe years ago, now appeals to him to take charge of the excavation. And not all the mysteries he and Amelia will need to unravel are those of the ancient past! Unlike the one in the first book, the mystery here definitely involves murder. It's also much more challenging; here, I didn't spot the culprit from the outset. (I had my suspicions as the book wore on, but I was still left guessing until the denouement.) One aspect of the resolution doesn't hold up well logically, but it's a secondary one; strictly speaking, this is a four-and-a-half star read on that account, but I rounded up. Again, Peter's characterizations are very well-drawn. Amelia's drily-humorous, deadpan narration can be an absolute scream in places; especially reading the early parts, set in England, I laughed out loud in several places (which I didn't do with the first book). Both the milieus of Victorian England and late-19th century Egypt are brought to masterful life here, and the author does a wonderful job in making use of actual ancient Egyptian mythology and lore and incorporating some real-life archaeological references into the tale. Amelia's character is the make-or-break factor here. Some readers (including my son-in-law, and a Goodreads friend who's reviewed this book) don't like her at all; and they aren't without reason for their reaction. She's got a hefty element of vanity and bossiness in her make-up, she's highly opinionated, and not as always right in her opinions as she complacently thinks she is; and she's not above trying to make herself seem more clever than she actually is. (Granted, she is smart --but she's not infallible.) Reverse sexism is one of her pet prejudices (she thinks much more highly of her husband than she does of most males, but they engage in plenty of one-upmanship with each other). And Catholic readers won't appreciate her passing comment about "the idolatrous practices of Popery" --though most English Protestants in 1889 shared her attitude. I mentioned in reviewing the first book that she doesn't like guns; in the intervening five years, she's learned to carry one in the field whether she likes it or not (and in an environment that's literally crawling with poisonous snakes, jackals, hyenas, and tomb robbers, that's a necessity), but she has a lot more to learn before she'll be a good example of safe and responsible handling of one. I want to quote V. Gingerich's wonderful review because it says it all. "The Curse of the Pharaohs is all about voice: Amelia Peabody’s voice. This detective, Egyptologist, and mother of one narrates with wit and humor, puncturing Victorian decorum with her steel-tipped parasol, amazing the reader with her (sometimes stupid) bravery and her unique way of both adoring and defying her Egyptologist husband." "Elizabeth Peters is Agatha Christie in an ancient Egyptian wig and headdress. Same train travel, same cast of startlingly unlikable characters (the kind where you want each of them to be the villain), same tea tables and crumpets (yes, tea, even in during an Egyptian heatwave), same twists and side alleys." Above all, I love the way Peters writes. She combines humor, quaint turns of phrase, fantastic vocabulary, a little romance and detailed atmosphere in a well told mystery. I love that she addresses the reader - so unique. I enjoyed the introduction of Ramses in this second of the series. It is hard to believe she could make a toddler so quirky and interesting. She paints such vivid and dimensional characters. I thought her relationship with Emerson would lose some spice now that they are married but no! It is as funny and endearing as ever. Only giving this a 3.5 though as it much of it seemed to repeat scenarios from the first book. Also, the plethora of murders was overboard for me. It was hard to take them seriously after a point. And some bits just lagged. It won't discourage me from going on in the series though. Her writing is totally unique. On this listen of this old favourite I was truly appreciative of Peters' skill as an author. The book is told as if it were Amelia Peabody's journal, but still Peters manages very cleverly to give us several views of all the wild twists and turns in the story. We aren't limited to Amelia's viewpoint because although she is a keen observer she isn't very self aware, and though she is very intelligent she often draws the wrong conclusions. It not only makes for an interesting puzzle it makes for s On this listen of this old favourite I was truly appreciative of Peters' skill as an author. The book is told as if it were Amelia Peabody's journal, but still Peters manages very cleverly to give us several views of all the wild twists and turns in the story. We aren't limited to Amelia's viewpoint because although she is a keen observer she isn't very self aware, and though she is very intelligent she often draws the wrong conclusions. It not only makes for an interesting puzzle it makes for some fine comedy as well. 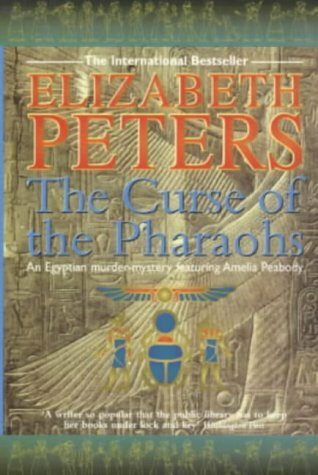 The Curse of the Pharaohs was another fun installment in the Amelia Peabody mystery/adventure series. The story begins with Amelia and Radcliffe Emerson enjoying the bliss of married life back in England, but their seemingly idyllic existence isn't exactly placid thanks to an incredibly precocious four-year-old running amok. At the same time, life holds no real challenge for Emerson who is now a professor of archeology at the university and Amelia who has been reduced to motherhood and the occasional tea party which she loathes. Both of them deeply yearn for their beloved Egypt and all the mysteries and antiquities that she holds, so when the opportunity to return presents itself, they jump at the chance. Of course, murder and mayhem ensue while Amelia and Emerson attempt to excavate a tomb which they believe may belong to a Pharaoh. Amelia and Emerson are still in fine form, and I enjoyed their newfound interactions as a married couple. In public, they employ their acerbic tongues to amusing effect with lots of witty bantering which could sometimes be quite fun to read. In private, they eagerly and generously share their affection and passion for one another (without details of course), but their tender feelings are still quite apparent even in veiled euphemisms. I loved that Amelia and Emerson trust each other explicitly and seem to have a healthy marriage free of any jealousies. I also like how they can tease each other without hurt feelings and understand each other completely. Even though their individual personalities differ quite a bit from mine and my husband's, I could still relate to their relationship quite well. Amelia and Emerson are just a really fun and entertaining couple to read about. Individually, Emerson and Amelia each has a very strong personality that has certain elements which can be a little off-putting, but at the same time rather endearing. Emerson is as blustery and irascible as he was in the first book, yet he always manages to command the respect of everyone around him. I like that he regards Amelia as his intellectual equal, his partner not only in life but in the work they both love so much. He has also turned into a doting papa to their little son, Ramses. I couldn't help but laugh at this big galoot being reduced to babbling baby talk to an infant. It was just too cute. Amelia, on the other hand, seemed almost as aloof toward Ramses as Emerson was adoring of him which rather confused me. While I didn't doubt that she cared for her son, Amelia calling Ramses “it” for a short time in infancy and her seeming lack of any compunction toward leaving him for long periods of time to go on digs was a little hard for me to understand. Most of the time Amelia didn't seem to like Ramses very much, however, I will allow that perhaps this was all meant more in jest, and was simply a little too subtle for me to appreciate. Otherwise, Amelia is a fully admirable character that I really liked. She has a very no-nonsense attitude about most everything, but certainly isn't immune to emotions where her beloved husband is concerned. She is also brave, adventurous, has a mind like a steel trap, and is readily sympathetic toward both man and beast alike. I was quite amused by Amelia's disdain for societal conventions. She is definitely a geek of the first order, and I can very much relate to her inability to talk to society women because of their lack of knowledge on the topics that interest her most. Overall, I really like both Emerson and Amelia and think that they are a very well-matched couple. Enjoyable listening for a car trip. I prefer how the narrator portrayed Amelia in book 1 as an indomitable and smart female. I also prefer Emerson in book 1. I do have books 3 and 4 in audio - they were on sale. I will listen to them. 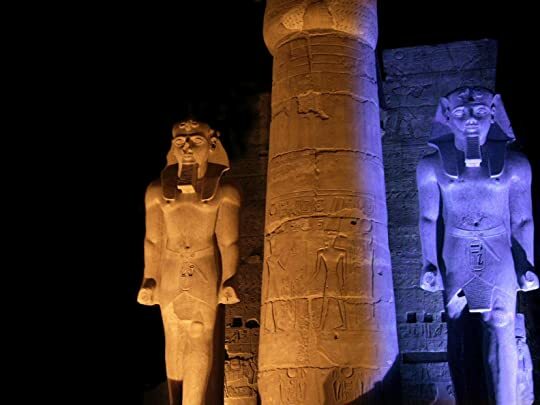 Luxor Temple, Egypt (Luxor was the ancient city of Thebes). ★★★☆☆ (This is a review of the audiobook.) This one didn’t do it for me. Loved the first one in the series (which I both read and listened to), also narrated by Barbara Rosenblat. However, this one put me to sleep repeatedly - literally! I had to keep starting over and over again. I don’t think it was the narration as much as the storyline. It just didn’t grab me like the first one did. Ms. Rosenblat does a nice job on the various acce Luxor Temple, Egypt (Luxor was the ancient city of Thebes). ★★★☆☆ (This is a review of the audiobook.) This one didn’t do it for me. Loved the first one in the series (which I both read and listened to), also narrated by Barbara Rosenblat. However, this one put me to sleep repeatedly - literally! I had to keep starting over and over again. I don’t think it was the narration as much as the storyline. It just didn’t grab me like the first one did. Ms. Rosenblat does a nice job on the various accents and Ramses as a baby, toddler, etc., and gruff Emerson’s bluster. Still. . . I’ll continue with this series, as I love Amelia. I enjoyed the story in this second book much more than the first. I loved Amelia performing a flying tackle to save her husband from getting hurt. I laughed so many times at how she describes and talks about people. I will definitely keep listening to this series. Fun in the sun with Amelia and Emerson as death comes on swift wings to Victorian archaeologists. When I was young I thought archaeology would be like this. It's not. Archaeology is sitting in a muddy field, in the rain, drawing stones. The book is good fun, the plot trots along nicely with big nods to Sherlock Holmes, Madame Blavatsky, and the opening of King Tut's tomb. Thankfully the author refrained from saying 'wonderful things', but I'm sure she's just saving it for a future episode. Prett Fun in the sun with Amelia and Emerson as death comes on swift wings to Victorian archaeologists. Pretty sure I'll read the next one. This review has been hidden because it contains spoilers. To view it, click here. A skit on the Lord Caernavon Curse story. The fashion comments are hilarious. I always feel let down when I read this book right after the first one. It's still a good mystery, and I can enjoy Amelia's strong voice, but it lacks so much of what I love in the first installment. For one thing, I don't find this book as amusing and fun as the first was. And I really miss that tight circle of Amelia and her three cohorts who battle it out against unknown forces through most of the first. Then, because this book come second it doesn't feel as creative or surprising as the firs I always feel let down when I read this book right after the first one. It's still a good mystery, and I can enjoy Amelia's strong voice, but it lacks so much of what I love in the first installment. For one thing, I don't find this book as amusing and fun as the first was. And I really miss that tight circle of Amelia and her three cohorts who battle it out against unknown forces through most of the first. Then, because this book come second it doesn't feel as creative or surprising as the first did; there's a lot of "same old stuff" about this story. And lets be honest, I want more of Emerson and Amelia's personal life, and you don't get that once they leave England. I liked this second book in the Amelia Peabody series better than the first book. Amelia and Emerson have been married for a several years now and are the parents of a young son. However, they are both going a little stir crazy after having given up their expeditions in favor of being hands on parents. So, when an opportunity arises to unearth a possible treasure trove in Egypt and solve a murder, the temptation is too much for the couple. They place their son in the capable hands of their relat I liked this second book in the Amelia Peabody series better than the first book. Amelia and Emerson have been married for a several years now and are the parents of a young son. However, they are both going a little stir crazy after having given up their expeditions in favor of being hands on parents. So, when an opportunity arises to unearth a possible treasure trove in Egypt and solve a murder, the temptation is too much for the couple. They place their son in the capable hands of their relatives and go on another adventure. Emerson is a riot. The chemistry between him and Amelia is charming, despite Emerson's gruff manner. The cast of characters were also unique and the in depth descriptions of Egypt, which the author obviously has experienced first hand, puts the reader right there along with the characters in the story. CURSE IT PEABODY, HOW DARE YOU MAKE FUN OF ME. I'm really kind of torn on what to rate this one... On the one hand, it's Amelia and Emerson, and they are brilliant characters, but on the other hand, there was just something about this book that left me a little... wanting. I really enjoyed the first book in the series, "The Crocodile on the Sandbank", and fell in love with both Amelia and Emerson in that book. Amelia was so smart, and strong and sure of herself, and her biting wit and force of will made her a creature to be reckoned with. Em I'm really kind of torn on what to rate this one... On the one hand, it's Amelia and Emerson, and they are brilliant characters, but on the other hand, there was just something about this book that left me a little... wanting. I really enjoyed the first book in the series, "The Crocodile on the Sandbank", and fell in love with both Amelia and Emerson in that book. Amelia was so smart, and strong and sure of herself, and her biting wit and force of will made her a creature to be reckoned with. Emerson is gruff and rude and pushy and misanthropic and generally thinks that all others besides himself are morons. But hey, Emerson, when you're right, you're right. Crocodile was fun and the mystery was engaging and it was a great start to what should be an amazing series. But I felt a little let down by the second book, honestly. The writing was still fantastic, though after the beginning, not quite as funny as I'd have liked. The beginning was perfect in my opinion, and set the bar high. Perhaps that's why I feel a bit let down. The story was great, and reminiscent of some classic mysteries (OK, mainly just one, which I'll touch on in a bit), but I just wanted a little bit of the sparkle that Amelia had in the first book back, and it seemed that was missing for me. This story takes place 5 years after the events of Crocodile. Emerson and Amelia are married, and now have a baby, Walter Peabody Emerson (nicknamed Ramses for his precociousness and resemblance to the ancient Pharaoh) who is, to put it bluntly, hell on wheels. He shares his parents' proclivity towards Egyptology and archaeology and has no qualms about digging in and getting dirty in the pursuit. Cute little bugger. Emerson and Amelia are called in as experts to help excavate a new-found tomb after the previous leader of the excavation team died, under what imagination-prone Amelia thinks is suspicious circumstances, as his assistant has gone missing. 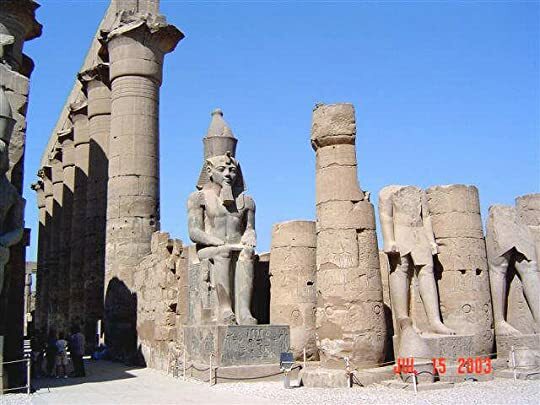 A reporter, covering local archaeological events, has intimated that the Egyptian gods are displeased with the tomb being opened and desecrated, and has claimed that there is a curse at work. Naturally E&A have no compunctions about getting back to work, curse or no curse, after being in England for so long, away from their beloved Egypt. I think that the 5 years between when the first book ended and the second book began had more of an effect than intended. Amelia seemed a little distant and cold and, I'll just put it out there, bitter at times. She's spent 5 years away from Egypt, and now has a son, but Amelia isn't the parenting type, really. She referred to little Ramses as "it" for a large portion of the book, and seemed to think of him not as a child but as an unknown creature completely separate from herself. In fact, later on in the story, she was more affectionate towards a cat than she was toward Ramses in the beginning of the story. I say this simply because I think that she will grow to be more comfortable with the role of "mother" in later books. It's not something that comes naturally to her, being very calculating and precise as she is. She has high expectations of everyone that she comes into contact with, and heaven help them if they don't meet them, including her son. That's not to say that she doesn't love her son - she does, she just does it in her own way, and most assuredly does not mollycoddle him. The only other mother in the bulk of the story, Madame Berengeria, is an example to make Amelia look like a candidate for World's Best Mother. MB likes to dress and act as different Egyptian queens reincarnated, has a fondness for brandy, and an overabundance of malicious dramatic urges. Her daughter, sweet and innocent Mary is hard put to live with her. Emerson takes naturally to being a father, and encourages little Ramses in his thirst for knowledge, as any parent would, even going so far as to have debates regarding the nature and origin of fossils dug up in the back yard. Like I said, cute little bugger. Emerson and Amelia's interaction throughout the story didn't have the same wit and charm that it had in Crocodile. He barked and she allowed it, sort of, in her own way. She still did whatever she felt that she needed to do, but in a decidedly less direct way than she had before her marriage. I can understand this, marriages were different things back then, but Amelia has always been herself and let nothing decide her actions for her. You could tell that Amelia absolutely adores her husband, and that she respects and admires him as well, chiefly because she's narrating the story herself. Likewise, we know that Emerson's gruffness and commanding attitude isn't how he really feels about her, because she interprets for him. But an outsider look in might see things very differently, and wonder how they could stand each other. Speaking of outsiders, there's a rather larger cast of characters in this book than there was in Crocodile, and it took me a little while to get everyone straight in their roles. There are some definitely interesting characters here, and I wonder if we might be seeing more of them later on in the series. Coming back to what I hinted at before... parts of this book really reminded me of Agatha Christie's novel "And Then There Were None". A large cast of characters who all are suspicious and who could all be the culprit are all gathered together in one area while deaths abound. I don't mind this really, as long as the story comes together and makes sense. And of course, Amelia and Emerson solved the puzzle before too many had died, so it was more of a homage than a copy-cat, but it had the feel. Archeologist Radcliffe Emerson is enticed to return to the exotic country of 1892 Egypt when Lady Baskerville offers him a job of finishing a tomb excavation in the Valley of the Kings begun by her recently deceased husband, Lord Henry Baskerville. Amelia Emerson, nee Peabody, is enormously eager for a second adventure in Egypt after her son Ramses’ third birthday and the somewhat dull English domestic bliss of recent years. Ramses is proving to be a handful as he is intellectually precocious, a Archeologist Radcliffe Emerson is enticed to return to the exotic country of 1892 Egypt when Lady Baskerville offers him a job of finishing a tomb excavation in the Valley of the Kings begun by her recently deceased husband, Lord Henry Baskerville. Amelia Emerson, nee Peabody, is enormously eager for a second adventure in Egypt after her son Ramses’ third birthday and the somewhat dull English domestic bliss of recent years. 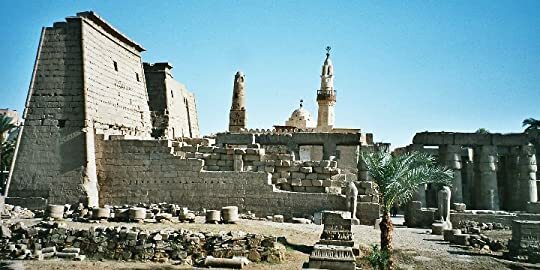 Ramses is proving to be a handful as he is intellectually precocious, and English society is suffocating, so Amelia has been yearning for the discomforts and challenges of archeological digs. As in the previous novel Crocodile on the Sandbank, the first in this amusing cozy series, Amelia jumps at the chance to exchange the safety of English life for the chance of an Egyptian expedition. Horrors! A murderer might be stalking the intrepid group of archaeologists, the annoying newspaper reporter and the various oddball hangers-on hoping to find an ancient tomb! Or is an occult curse of an angry Egyptian mummy haunting the group of adventurers? When Lord Baskerville, a noted amateur archaeologist dies in Egypt, his widow chooses Emerson to carry on his mission. Naturally Emerson demurs - he can't leave Amelia or their beloved three-year-old holy terror Ramses - or can he? Emerson and Amelia are both bored with Victorian gentry life and miss the thrill of their work in the Middle East. They place Ramses in the loving Care of Evelyn and Walter's nursery and off they go. Amelia is certain that Lord Baskerville did not die of natural cause When Lord Baskerville, a noted amateur archaeologist dies in Egypt, his widow chooses Emerson to carry on his mission. Naturally Emerson demurs - he can't leave Amelia or their beloved three-year-old holy terror Ramses - or can he? Emerson and Amelia are both bored with Victorian gentry life and miss the thrill of their work in the Middle East. They place Ramses in the loving Care of Evelyn and Walter's nursery and off they go. Amelia is certain that Lord Baskerville did not die of natural causes, for marked on his forehead was the Uraeus (the stylized, upright form of an Egyptian cobra used as a symbol of sovereignty, royalty, deity, and divine authority in ancient Egypt). There's also the small matter of his missing archeologist excavator. Emerson thinks there's nothing afoot and dismisses the native superstitions about Pharaohs' curses the English press, led by Kevin O'Connell, seem to enjoy. Amelia is determined to solve the mystery and prove herself to Emerson. She's also determined to play matchmaker and get to the bottom of a romantic triangle. Emerson wishes she'd just put safe and sound. This is one battle of the sexes that fans of the first book won't want to miss. I liked this book so much more than the first one. There's more humor in it, for one thing, and the mystery was very hard to figure out. There are a large number of suspects in this story and I didn't figure it out. When I was up in the wee hours of the early morning, I had to skip ahead to find out who the murderer was before I could sleep. I was a little surprised at the reveal. The motive was very weak and the events that transpired seemed stupid in comparison to some of the other theories. The Egyptian history parts seemed based on King Tut's tomb, opened in the 1920s. There's less complicated facts thrown out at the reader because most of us are familiar with King Tut. Emerson and Amelia don't find him all that important or interesting in the grand scheme of things but their work is important in understanding and preserving Egyptian history so they persist. The Victorian British snobbery is present but toned down a lot from the first book so it's palatable for a modern audience. The characters in this story are top-notch. Amelia is more human and more feminine. She still has a good head on her shoulders but she's strong-willed enough to defy her husband when he tries to keep her safe. She reminds me of Lady Julia Gray but more together. Amelia has some very funny scenes. I just love the relationship between Amelia and Emerson. We get to know him much better in this book. He has some hidden depths that only Amelia sees regularly. He surprised me. Amelia and Emerson are a very loving couple but anything more than kisses and buttons popping is fade to black. Their son, Ramses, takes the cake. He is so precocious and such a little tyrant, he reminds me of my younger niece. Ramses needs boarding school -pronto! The other really funny character is Madame Berengaria. I don't really know what her deal was, attention maybe, but she was really really funny with her Egyptian reincarnation pronouncements. I did not like Lady Baskerville pretty much for the same reasons Amelia didn't. She put me off from the start and it was obvious she meant to have Emerson to herself. The other characters include an American millionaire, who, judging from his speech, might currently be from New York, but was raised in the West or Texas. There's also an Irish reporter who would do anything for a story; a lovestruck German lexicographer; Mary, a devoted daughter and talented artist, and Bastest, the cat. 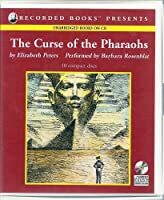 The Curse of the Pharaohs is all about voice: Amelia Peabody’s voice. This detective, Egyptologist, and mother of one narrates with wit and humor, puncturing Victorian decorum with her steel-tipped parasol, amazing the reader with her (sometimes stupid) bravery and her unique way of both adoring and defying her Egyptologist husband. This book came right when I wanted it. Every few months I crave a good mystery- not a bold and modern thriller, something clever but relatively gore-less and blushle The Curse of the Pharaohs is all about voice: Amelia Peabody’s voice. This detective, Egyptologist, and mother of one narrates with wit and humor, puncturing Victorian decorum with her steel-tipped parasol, amazing the reader with her (sometimes stupid) bravery and her unique way of both adoring and defying her Egyptologist husband. This book came right when I wanted it. Every few months I crave a good mystery- not a bold and modern thriller, something clever but relatively gore-less and blushless- so I don't understand how I've wandered through libraries all these years without meeting Elizabeth Peters and Amelia Peabody. Elizabeth Peters is Agatha Christie in an ancient Egyptian wig and headdress. Same train travel, same cast of startlingly unlikable characters (the kind where you want each of them to be the villain), same tea tables and crumpets (yes, tea, even in during an Egyptian heatwave), same twists and side alleys. Supposedly, this is her least exciting book. She kept me reading. Supposedly, she said that if you want to read about Egyptian scenery and customs, read a travel book. I like her Egypt. I originally rated this book 3.5 stars but after reading the 3rd in the series, I decided I should rated this one higher! I enjoy these books so much - I pretty much bookmarked half the book - that I should reflect that in my rating. The Curse of the Pharaohs is set 5 years after Amelia & Emerson's marriage. At the beginning, I had trouble in this switch in their relationship - there wasn't as much funny bickering as in the first book - but then it dawned on me how amazingly well matched they I originally rated this book 3.5 stars but after reading the 3rd in the series, I decided I should rated this one higher! I enjoy these books so much - I pretty much bookmarked half the book - that I should reflect that in my rating. The Curse of the Pharaohs is set 5 years after Amelia & Emerson's marriage. At the beginning, I had trouble in this switch in their relationship - there wasn't as much funny bickering as in the first book - but then it dawned on me how amazingly well matched they were. They are both so strong and eccentric. You would think that Amelia, with her controlling tendencies, would have issues with Emerson's quirks, but farther from the truth! They enjoy the way the other is and support each other immensely. Emerson saw no reason why anything, up to and including death, should excuse a man for poor scholarship. Let me congratulate you, Professor. You are a smooth a crook as I ever met. And that's saying something. Emerson beamed. "Thank you!" Fast paced, fun loving, Egyptian mystery! Amelia Peabody is at it again! She and her archaeologist husband are solving crimes and tombs are not the only thing they are digging for. If you need a good chuckle, or a great mystery that will keep you guessing until the last couple of pages, then you have found your poison. The Emerson's just want a quiet digging season, but with a curse, missing persons and possibly a murder, it is anything but. Add in a damsel in distress, and a woman who thinks she Fast paced, fun loving, Egyptian mystery! Amelia Peabody is at it again! She and her archaeologist husband are solving crimes and tombs are not the only thing they are digging for. If you need a good chuckle, or a great mystery that will keep you guessing until the last couple of pages, then you have found your poison. The Emerson's just want a quiet digging season, but with a curse, missing persons and possibly a murder, it is anything but. Add in a damsel in distress, and a woman who thinks she is Egyptian royalty reincarnate, and it makes for one digging season for the books.. literally. As they work through the disturbances, a reporter has made a nuisance of himself through asking questions and reporting back on their to-do's. He somehow always manages to be in the right place at the wrong time. New parents Amelia Peabody and Radcliffe Emerson are jonesing to get back to Egypt after being away four years raising Ramses. Even knowing of the deadly curse, they jump at the chance to return when asked by Lady Baskerville whose husband has just been killed after opening a newly discovered tomb. Neither Amelia nor Emerson believe in the supernatural so the various happenings and the mysterious murders, don't scare them off as intended. This is another tale of murder and mayhem in the Valley o New parents Amelia Peabody and Radcliffe Emerson are jonesing to get back to Egypt after being away four years raising Ramses. Even knowing of the deadly curse, they jump at the chance to return when asked by Lady Baskerville whose husband has just been killed after opening a newly discovered tomb. Neither Amelia nor Emerson believe in the supernatural so the various happenings and the mysterious murders, don't scare them off as intended. This is another tale of murder and mayhem in the Valley of the Kings where the Father of Curses (Emerson) once again takes control of a crazy situation and shows the natives how it's done. I keep trying to like this series but find Amelia Peabody such an obnoxious snob that it is almost impossible. I think I am done with this series now after 2 books. Elizabeth Peters is a pen name of Barbara Mertz. She also wrote as Barbara Michaels as well as her own name. Born and brought up in Illinois, she earned her Ph.D. in Egyptology from the University of Chicago. Mertz was named Grand Master at the inaugural Anthony Awards in 1986 and Grand Master by the Mystery Writers of America at the Edgar Awards in 1998. She lived in a historic farmhouse in Frede Elizabeth Peters is a pen name of Barbara Mertz. She also wrote as Barbara Michaels as well as her own name. Born and brought up in Illinois, she earned her Ph.D. in Egyptology from the University of Chicago. Mertz was named Grand Master at the inaugural Anthony Awards in 1986 and Grand Master by the Mystery Writers of America at the Edgar Awards in 1998. She lived in a historic farmhouse in Frederick, western Maryland until her death.